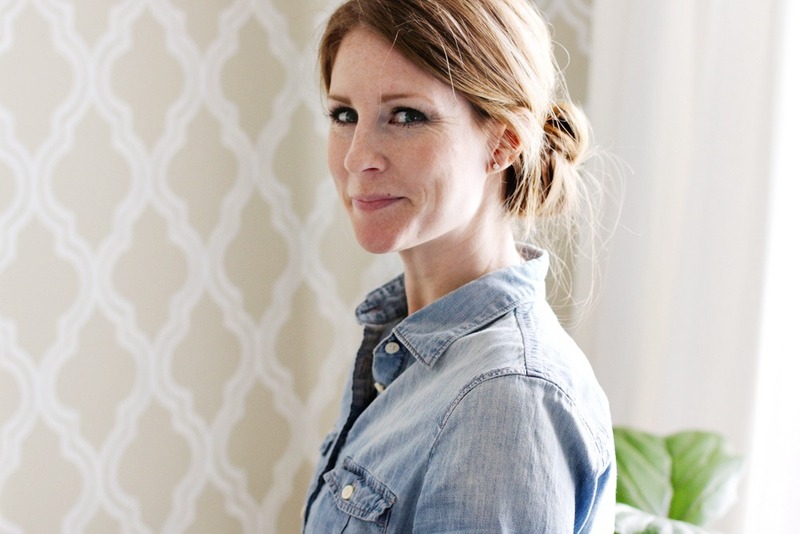 Today I’m joining a group of talented bloggers on a Cozy Spring Home Tour hosted by Rachel from Shades of Blue Interiors + Country Living Magazine and sponsored by HomeGoods. Country Living wrote a great roundup article with 22 ways to decorate for spring pulling from each space (read that here) and be sure to scroll all the way down for links to all of the other pretty rooms decorated for Spring! I signed up to join this Spring tour of homes before I had any idea if I would have a room in our new house that was mildly ready for photos. The house is in a constant state of disarray as we make improvements and updates which is super fun and exciting for us, but it makes it tricky to style and photograph a put-together room. In fact, as we speak, the entire upstairs is undergoing a makeover with new paint, trim and carpet going in which means everything had to be moved out and therefore is now piled into the living and dining rooms. So basically, the house is a mess. Thankfully, we have this great space – outside of the house – that sits above the garage and has slowly but surely been coming together. I lovingly refer to it as The Studio. This tour was just the motivation I needed to finally unpack boxes, finish a few diy projects and pretty things up to make it ready for spring. I am so, so happy with how this space looks and feels! In case you missed any of the previous posts about this space, here is the before and after and this was the initial design plan. Initially, the idea was for me and Ryan to use the studio as our joint work space. Since we work from home and work together, it made sense to share an office. But then, somehow, Ryan claimed the small office in the house and gave the whole studio to me. It feels like an absolute dream to have this room to work, play, create, relax, workout and gather in. Staying true to my decorating style, the main pieces in the studio are all very neutral: white, natural wood tones, warm leather, a touch of black, linen, mixed metals and woven baskets. We semi-built-in a desk to ground the space and give lots of storage and surface area to work and create (full details coming soon). Just last week I installed the floating shelves and could not wait to style them with a mix of functional items (the file boxes and letter sorter) and decorative (art, ribbon, vases + plants). My favorite part about starting with a mainly neutral palette is that decorating for each season becomes very easy. By simply adding in a few inexpensive accessories like pillows, vases, art prints and throws, you get a seasonal look without having to change, spend (or store!) much. To add a touch of spring to the studio, I surprised myself and decided to add little bits of pink around the room. Pink has never been my go-to color, but I’m very much loving how it adds a feminine touch to all of the slightly masculine lines and finishes. SIMPLE TIP: The key to adding in a ‘pop’ of color is to mix the tones for a natural, layered look. In this case, there are bright, light, peachy and dusty pinks all mixed together rather than one consistent shade of pink. This room is so charming with two big dormers that let in lots of natural light. In one dormer lives my rescued fiddle leaf fig tree. It was near death at the hardware store and they sold it to me for a discount because of its sad state. My mission is to nurse this guy back to health and so far, so good. The second dormer is a reading area with a cozy chair and new side table I found last week at HomeGoods. I’ve been on the hunt for something petite but sturdy and this hairpin/marble combo is perfect. And, of course, a room of mine would not be complete without lots and lots of greenery. I love the freshness it brings, the texture and color. All of the plants seen in this space are from my local hardware store – nothing fancy or precious and as long as I remember to keep them watered, they should last a long time. We still have a few more projects to complete in the studio and much more to share. Soon I’ll give all the details on the desks, how the drawers are organized, a new work table for the center of the room, a diy dog bed for my constant companion, Atlas, and a final finished tour of the space. Until then, I hope you enjoyed a peek at the space styled for spring! There are so many gorgeous homes to visit on the tour … grab a cup of coffee and have fun clicking through for loads and loads of spring decorating tips and inspiration. This plant is a relative of Boston Ivy Parthenocissus tricuspidata (par-then-oh-KISS-us; par-then-oh-SISS-us try-kusp-ee-DAY-tuh) & Virginia creeper Parthenocissus quinquefolia (par-then-oh-KISS-us; par-then-oh-SISS-us kwin-kway-FOH-lee-uh, kwin-kwee-FO-lee-ah. What an amazing room! I love following your tutorials on this space. So great being on this tour with you. Gorgeous! I absolutely love the touches of pink and greenery. It’s so refreshing after a drab winter. You have a beautiful space! So beautiful, Emily! Your design style has been such an inspiration to me in my own home. :) Thank you! What was your solution to the chairs being too short? Love how the whole space came together! I like the hints of pink. My daughter and I would love to find even a dying Fiddle Leaf Fig tree here in NC – they are nowhere to be found – I think you have them all on the west coast!!! 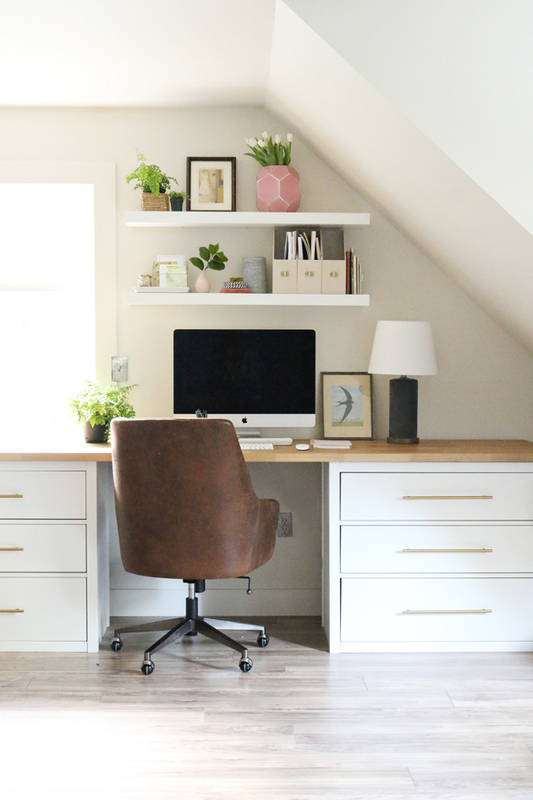 I love how you made this studio multi-functional… with lots of open space, a little reading nook, and study area with lots of storage. You have impeccable taste Emily and I’m so happy you joined. Your tips about pinks is so true– it feels more interesting and authentic when it isn’t just one shade. I also love how you have your items listed below each pictures in an unobtrusive and organized way. Your studio is dreamy and all of the pops of pink look fantastic! What a great space. Lovely space you have! It’s been fun following the renovation of this space. I love the plant on the left side shelves that hangs along the window. Would you mind sharing what plant that is? I’ve been looking for a plant such as this. The plant is from Home Depot (it came with the hanging hook thing that I just took off). The tag says “8” assorted hanging”. Isn’t that helpful? :) Not sure what the name of it is, but just check at your local hardware/nursery and see what hanging plants they have that you like. Ha! Those darn tags. Thank you for checking! I’ll be on the look out for some cute draping planters. That touch of pink is perfect. I love it. It’s so pretty and I love that plant trailing from the shelf. It’s so pretty! I am loving your touches of pink and of course your little pieces of greenery throughout. Beautiful job as always! I love your green thumb and all your plants (all over your house). My question is do you get those small little bugs that fly around/are attracted to plants?? It drives me crazy and therefore I only have 3 small house plants. Wondering if there is something I could do to prevent them? p.s. the studio is amazing! We don’t have any bugs yet, but I’m sure this summer we will experience the annoying gnats and fruit flies. I think you can spray them with something natural to get rid of them … I’ll look it up and see what I can find. Love the simple beauty you create. Not too much, rather unassuming, but totally inviting. Keep up the great design. This is such a nice compliment! Thank you. So gorgeous, as always! Would you be willing to share the source for the pretty artwork leaning on the left side of the desk? Hello ! 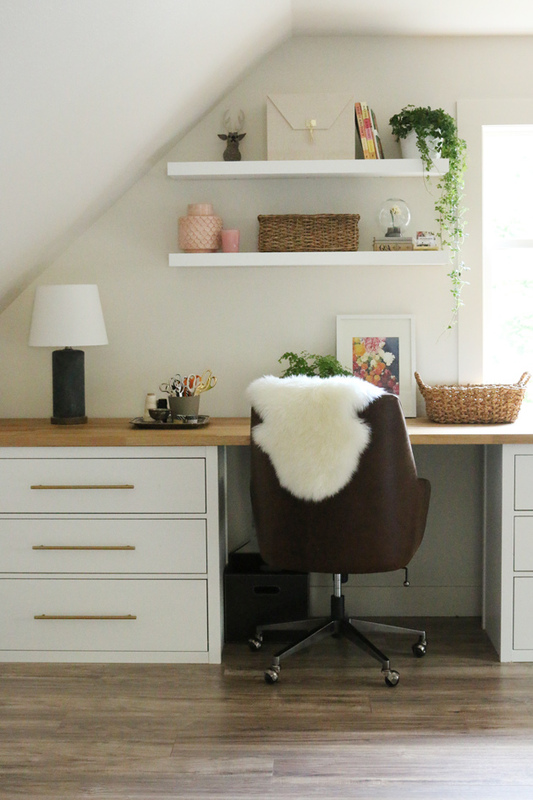 Love your office/study room space. Can you share what wall colors did you use ? And if the desk is not white but black would you still go with white shelves or black shelves? Love the plants it makes the room feel alive!!! The walls and trim are painted Shoji White by Sherwin Williams. I like how the white shelves relate to the desks, but I think you could go with white shelves and a black desk as well. Especially if the walls are white. Answers: I like scissors :) I have a pair of sewing shears, small sewing scissors, ones I use only for paper and ones for ribbon, pinking shears and a few extras in different sizes because they make me happy. I will show how the drawers are organized soon! Gorgeous! One of my favorite small details is the pink bud vase with the rich green branch on the lower floating shelf. So excited to see this room come together. Isn’t that a sweet little vase?! I found it at Michaels and cut a piece of our camelia bush to pop in there.